Atomic Energy Museum, which is the only one of its type in Europe, invites the visitors at the northern section of the Paks Nuclear Power Plant in a 2000 m2 impressively renovated warehouse. In front of the building, a large outdoor exhibiting space awaits the visitors with special artworks. Upon entering the entrance hall, six topics are offered for review at the information desk: the plant's past, present and future. This part of the museum is suitable for museum educational activities, even film screenings. The exhibition consists of a number of smaller and larger thematic units, which show the plant's construction, its operation history, and related to these the relics from the 1960s up to today. The exhibition space is divided into two major parts. 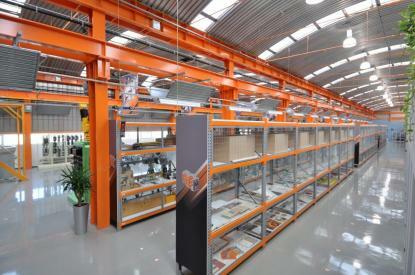 The right section deals with large equipments, on the left small items can be found arranged in glass cases. The service equipment, as well as the simulation computer, which operated during the 1990s, and was used by operators and the training of personnel operating the blocks are located in a separate room at. On the museum gallery, the visitors may learn about six institutions supporting our collecting work- Budapest University of Technology and Economics Institute of Nuclear Techniques, University of Debrecen Physical Institute of the Hungarian Academy of Sciences Nuclear Research, Hungarian Academy of Sciences Central Research Institute for Physics Atomic Energy Research Institute, Radioactive Waste Management Public Limited Company, GAMMA. Technical Ltd. The visitors can view the particular previously used instruments important with view of technology historically . Visitors can also learn about the history of the Plant by way of modern technical equipment, they may learn interactively about the various equipment used in the power plant. On the touch-screen information desk images and video clips provide a wide range of information on the former use of the items on display. The Atomic Energy Museum - as a museum of nationwide collecting range also provides an opportunity for those interested in the storages: library, film library and the repository, in addition to the exhibits.